Included in the Constitution on October 17, 1949, Article 370 exempts J&K from the Indian Constitution (except Article 1 and Article 370 itself) and permits the state to draft its own Constitution. It restricts Parliament’s legislative powers in respect of J&K. For extending a central law on subjects included in the Instrument of Accession (IoA), mere “consultation” with the state government is needed. But for extending it to other matters, “concurrence” of the state government is mandatory. The IoA came into play when the Indian Independence Act, 1947 divided British India into India and Pakistan. For some 600 princely states whose sovereignty was restored on Independence, the Act provided for three options: to remain an independent country, join Dominion of India, or join Dominion of Pakistan — and this joining with either of the two countries was to be through an IoA. Though no prescribed form was provided, a state so joining could specify the terms on which it agreed to join. The maxim for contracts between states is pacta sunt servanda, i.e. promises between states must be honoured; if there is a breach of contract, the general rule is that parties are to be restored to the original position. A number of other states enjoy special status under Article 371, from 371A to 371I. What were the terms included in the IoA for Kashmir? The Schedule appended to the Instrument of Accession gave Parliament the power to legislate in respect of J&K only on Defence, External Affairs and Communications. In Kashmir’s Instrument of Accession in Clause 5, Raja Hari Singh, ruler of J&K, explicitly mentioned that the terms of “my Instrument of Accession cannot be varied by any amendment of the Act or of Indian Independence Act unless such amendment is accepted by me by an Instrument supplementary to this Instrument”. Clause 7 said “nothing in this Instrument shall be deemed to commit me in any way to acceptance of any future constitution of India or to fetter my discretion to enter into arrangements with the Government of India under any such future constitution”. How did the accession come about? Raja Hari Singh had initially decided to remain independent and sign standstill agreements with India and Pakistan, and Pakistan in fact signed it. But following an invasion from tribesmen and Army men in plainclothes from Pakistan, he sought the help of India, which in turn sought the accession of Kashmir to India. Hari Singh signed the Instrument of Accession on October 26, 1947 and Governor General Lord Mountbatten accepted it on October 27, 1947. How was Article 370 enacted? The original draft was given by the Government of J&K. Following modification and negotiations, Article 306A (now 370) was passed in the Constituent Assembly on May 27, 1949. Moving the motion, Ayyangar said that though accession was complete, India had offered to have a plebiscite taken when the conditions were created, and if accession was not ratified then “we shall not stand in the way of Kashmir separating herself away from India”. On October 17, 1949, when Article 370 was finally included in the Constitution by India’s Constituent Assembly, Ayyangar reiterated India’s commitment to plebiscite and drafting of a separate constitution by J&K’s Constituent Assembly. Was Article 370 a temporary provision? It is the first article of Part XXI of the Constitution. The heading of this part is ‘Temporary, Transitional and Special Provisions’. Article 370 could be interpreted as temporary in the sense that the J&K Constituent Assembly had a right to modify/delete/retain it; it decided to retain it. Another interpretation was that accession was temporary until a plebiscite. The Union government, in a written reply in Parliament last year, said there is no proposal to remove Article 370. Delhi High Court in Kumari Vijayalaksmi (2017) too rejected a petition that said Article 370 is temporary and its continuation is a fraud on the Constitution. The Supreme Court in April 2018 said that despite the headnote using the word “temporary’, Article 370 is not temporary. In Sampat Prakash (1969) the SC refused to accept Article 370 as temporary. A five-judge Bench said “Article 370 has never ceased to be operative”. Thus, it is a permanent provision. Can Article 370 be deleted? Yes, Article 370(3) permits deletion by a Presidential Order. Such an order, however, is to be preceded by the concurrence of J&K’s Constituent Assembly. Since such an Assembly was dissolved on January 26, 1957, one view is it cannot be deleted anymore. But the other view is that it can be done, but only with the concurrence of the State Assembly. What is Article 370’s significance for the Indian Union? Article 370 itself mentions Article 1, which includes J&K in the list of states. Article 370 has been described as a tunnel through which the Constitution is applied to J&K. Nehru, however, said in Lok Sabha on November 27, 1963 that “Article 370 has eroded”. India has used Article 370 at least 45 times to extend provisions of the Indian Constitution to J&K. This is the only way through which, by mere Presidential Orders, India has almost nullified the effect of J&K’s special status. By the 1954 order, almost the entire Constitution was extended to J&K including most Constitutional amendments. Ninety-four of 97 entries in the Union List are applicable to J&K; 26 out of 47 items of the Concurrent List have been extended. ; 260 of 395 Articles have been extended to the state, besides 7 of 12 Schedules. The Centre has used Article 370 even to amend a number of provisions of J&K’s Constitution, though that power was not given to the President under Article 370. Article 356 was extended though a similar provision that was already in Article 92 of the J&K Constitution, which required that President’s Rule could be ordered only with the concurrence of the President. To change provisions for the Governor being elected by the Assembly, Article 370 was used to convert it into a nominee of the President. To extend President’s rule beyond one year in Punjab, the government needed the 59th, 64th, 67th and 68th Constitutional Amendments, but achieved the same result in J&K just by invoking Article 370. Again, Article 249 (power of Parliament to make laws on State List entries) was extended to J&K without a resolution by the Assembly and just by a recommendation of the Governor. In certain ways, Article 370 reduces J&K’s powers in comparison to other states. It is more useful for India today than J&K. Is there any ground in the view that Article 370 is essential for J&K being a part of India? Article 3 of the J&K Constitution declares J&K to be an integral part of India. In the Preamble to the Constitution, not only is there no claim to sovereignty, but there is categorical acknowledgement about the object of the J&K Constitution being “to further define the existing relationship of the state with the Union of India as its integral part thereof. Moreover people of state are referred as ‘permanent residents’ not ‘citizens’.” Article 370 is not an issue of integration but of autonomy. Those who advocate its deletion are more concerned with uniformity rather than integration. Article 35A stems from Article 370, having been introduced through a Presidential Order in 1954. Article 35A is unique in the sense that it does not appear in the main body of the Constitution — Article 35 is immediately followed by Article 36 — but comes up in Appendix I. Article 35A empowers the J&K legislature to define the state’s permanent residents and their special rights and privileges. Why is it being challenged? The Supreme Court will examine whether it is unconstitutional or violates the basic structure of the Constitution. But unless it is upheld, many Presidential Orders may become questionable. Article 35A was not passed as per the amending process given in Article 368, but was inserted on the recommendation of J&K’s Constituent Assembly through a Presidential Order. Article 370 is not only part of the Constitution but also part of federalism, which is basic structure. Accordingly, the court has upheld successive Presidential Orders under Article 370. Since Article 35A predates basic structure theory of 1973, as per Waman Rao (1981), it cannot be tested on the touchstone of basic structure. Certain types of restrictions on purchase of land are also in place in several other states, including some in the Northeast and Himachal Pradesh. Domicile-based reservation in admissions and even jobs is followed in a number of states, including under Article 371D for undivided Andhra Pradesh. The Centre’s recent decision extending to J&K reservation benefits for SCs, STs, OBCs and those living along international borders, announced last week. throws the spotlight back on Article 35A. 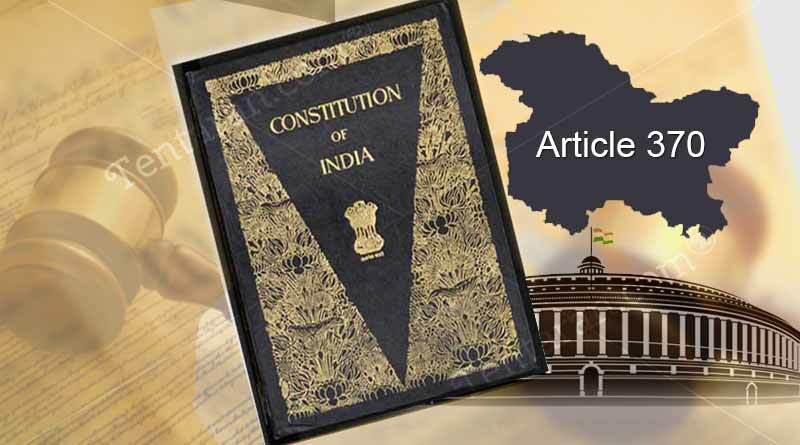 Part of the Constitution ever since it came into effect, it lays down that only two Articles would apply to J&K: Article 1, which defines India, and Article 370 itself. Article 370 says other provisions of the Constitution can apply to J&K “subject to such exceptions and modifications as the President may by order specify”, with the concurrence of the state government and the endorsement of the J&K Constituent Assembly. Introduced by a Presidential Order of 1954, it empowers the J&K legislature to define a “permanent resident” of the state, and to provide special rights and privileges to those permanent residents.